In 2000, US military personnel are being required under the threat of court-martial to be inoculated with an anthrax vaccine. But the vaccine, known as Anthrax Vaccine Absorbed (AVA), is not working very well and some soldiers are getting sick. This results in a loud public outcry lasting into 2001. One of the key scientists working on the vaccine is future anthrax attacks suspect Bruce Ivins. The FDA should implement a moratorium on direct consumer advertising of recently approved classes of drugs until enough aggregate data is available to confirm the drugs’ safety. Packaging for such medications should have a special symbol imprinted on them alerting consumers to the higher risk associated with new medications. The FDA should be required to reevaluate the safety and effectiveness of drugs at least once every five years after the drug has been approved. The agency’s current system for monitoring drug safety post-approval is far less effective than pre-approval testing. The report notes that there is a history of fierce disagreements between the FDA’s Office of Drug Safety and the agency’s Office of New Drugs. The FDA should be given new powers to impose fines, injunctions, and withdrawals when drug companies fail to complete the required safety studies. The agency should be given the authority to impose a wider range of restrictions on drugs it considers potentially unsafe. The government should require drug companies to register all clinical trials they sponsor in a government-run database so patients and physicians can review all studies. Currently, only those studies published in medical journals are accessible to the public, and these tend to be the studies that produce the most favorable results for the drug being tested. James Haveman, a 60-year old social worker and the director of a faith-based international relief organization, is recommended by the former Republican governor of Michigan, John Engler, to run Iraq’s health care system. Haveman earned Engler’s approval by running a large Christian adoption agency in Michigan that pushed pregnant women not to have abortions. Engler recommends Haveman to Paul Wolfowitz, the deputy secretary of defense; Haveman is soon dispatched to Baghdad to oversee the rebuilding of Iraq’s health-care system. Replacing the Expert with the 'Loyalist' - Wolfowitz orders the immediate firing of Dr. Frederick Burkle, who worked the issue during the invasion. Unlike Haveman, Burkle has extensive experience in such areas: he has multiple degrees in public health, taught disaster-response issues at Johns Hopkins University, and is currently a deputy assistant administrator for the US Agency for International Development (USAID), who sent him to Baghdad in the days after the invasion. Burkle has extensive experience working in postwar climates such as Kosovo, Somalia, and Iraq after the 1991 Persian Gulf War. A USAID colleague will call him the “single most talented and experienced post-conflict health specialist working for the United States government.” However, Burkle lacks the Republican political connections. A USAID official tells Burkle that the White House wants a “loyalist” in the job, and Haveman fits the bill. Anti-Smoking Campaigns, Fee-Based Care - Haveman’s tenure is marked by voluble recitations of how well the reconstruction is going: he tells anyone who will listen about how many Iraqi hospitals have reopened and about the pay raises Iraqi doctors have received. He refuses to discuss how decrepit most Iraqi hospitals still are, or the fact that many of Iraq’s best doctors are fleeing the country. Haveman mounts an aggressive anti-smoking campaign (and appoints a closet smoker to head it), ignoring comments that Iraqis have far bigger dangers in their lives than tobacco and recommendations that CPA funds might better be spent trying to combat fatal maladies running rampant through Iraqi populations. Haveman, a conservative ideologue, is offended by the idea that health care in Iraq is free. He institutes a fee-based health care system instead. Most importantly, he allocates almost all of the Health Ministry’s share of US reconstruction funds—some $793 million—to renovating Iraqi maternity hospitals and building community medical clinics. He later explains that his goal is “to shift the mind-set of the Iraqis that you don’t get health care unless you go to a hospital.” Unfortunately, his decision means that no funds are available to reconstruct emergency rooms and operating theaters in Iraqi hospitals, which are being overrun with injuries from insurgent attacks. Privatizing the Drug Supply Distribution Process - Haveman opposes the idea of state-based drug and medical supply distribution on ideological grounds. Instead, he decides to privatize the dysfunctional government firm that imports and distributes drugs and medical supplies to Iraqi hospitals. When he served as Michigan’s director of community health, he dramatically cut the amount of money Michigan spent on prescription drugs for poor citizens by limiting the medications doctors could prescribe to Medicaid patients. 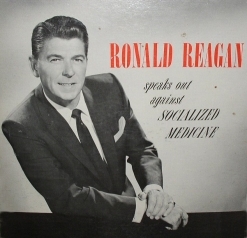 He instituted a short list of cheaper drugs that poor patients were limited to using. Haveman decides that the same approach will work in Iraq. Currently, Iraq has around 4,500 drugs on its formulary, and Haveman decides the list is much too long. Any private firm who wants to bid on the job of supplying drugs and medical supplies will not want to deal with such a long list. Haveman also wants to restrict the firm to buying American-made drugs and supplies—no more medicines from Iran, Syria, or Russia. The Pentagon sends Haveman three formulary experts to help him implement his plan, including Lieutenant Commander Theodore Briski, a Navy pharmacist. Haveman’s order, as Briski later recalls, is “Build us a formulary in two weeks and then go home.” Two days into his position, Briski decides that Haveman’s plan is untenable. The existing formulary works well enough, he believes. Haveman wants to redesign “the entire Iraqi pharmaceutical procurement and delivery system, and that was a complete change of scope—on a grand scale.” Most importantly, Briski recalls, Haveman and his advisers “really didn’t know what they were doing.” Others agree, including many on Haveman’s team. Rewriting the formulary is a major distraction, they argue, as is privatizing the pharmaceutical distribution process. Haveman ignores the immediate needs of the populace for his grandiose, ill-considered plans. 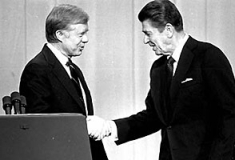 Clips of Thompson, Bush included in VNRs provided to local TV stations. 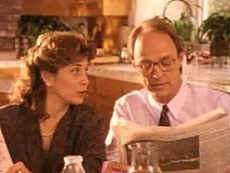 [Source: New York Times]New York Times reporter Robert Pear discovers that the Bush administration has employed two fake “reporters,” Karen Ryan and Alberto Garcia, who have appeared in administration-produced television “news” segments—“video news releases,” or VNRs—designed to promote the administration’s new Medicare prescription-drug policies. (Garcia primarily appeared in Spanish-language Medicare VNRs.) HHS had budgeted $124 million for the fake news segments, more than most real news organizations can provide. The segments are under investigation by the General Accounting Office (GAO) for possible violation of government statutes prohibiting the use of federal money to produce propaganda or partisan presentations. 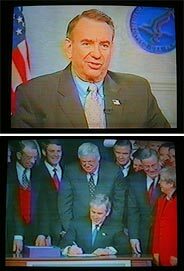 The Secretary for Health and Human Services (HHS), Tommy Thompson, appears in one of the segments, saying, “This is going to be the same Medicare system only with new benefits, more choices, more opportunities for enhanced benefits.” Several others show a crowd giving President Bush a standing ovation as he signs the new Medicare bill into law. Another segment shows a pharmacist talking to an elderly customer. The pharmacist says the new law “helps you better afford your medications,” and the customer says, “It sounds like a good idea.” The pharmacist agrees, “A very good idea.” The segments, professionally produced and ending with tag lines such as “In Washington, I’m Karen Ryan reporting,” were regularly aired by at least 50 local television news broadcasts in 40 cities around the country. The government also provides scripts that can be used by local news anchors to introduce, or “walk up,” the VNRs. One script suggested that anchors read the following: “In December, President Bush signed into law the first-ever prescription drug benefit for people with Medicare. Since then, there have been a lot of questions about how the law will help older Americans and people with disabilities. Reporter Karen Ryan helps sort through the details.” A VNR is then broadcast explaining how the new law benefits Medicare recipients. Legal? - GAO lawyers say that their initial investigations found that other fliers and advertisements disseminated by HHS to promote the new Medicare policies are legal, though they display “notable omissions and other weaknesses.” Administration officials claim the VNRs are also a legal, effective way to educate Medicare beneficiaries. The GAO is still investigating the VNRs. GAO investigators believe that they might violate the law in at least one aspect: misleading viewers by concealing their government origins. Federal law expressly forbids the use of federal money for “publicity or propaganda purposes” not authorized by Congress. Earlier investigations have found government-disseminated editorials and newspaper articles illegal if they did not identify themselves as coming from government officials. The GAO will find that the VNRs break two federal laws forbidding the use of federal money to produce propaganda (see May 19, 2004).